Tensions between Spain and France had finally led into war. France had been aware of it for a long time and had prepared well for that moment. 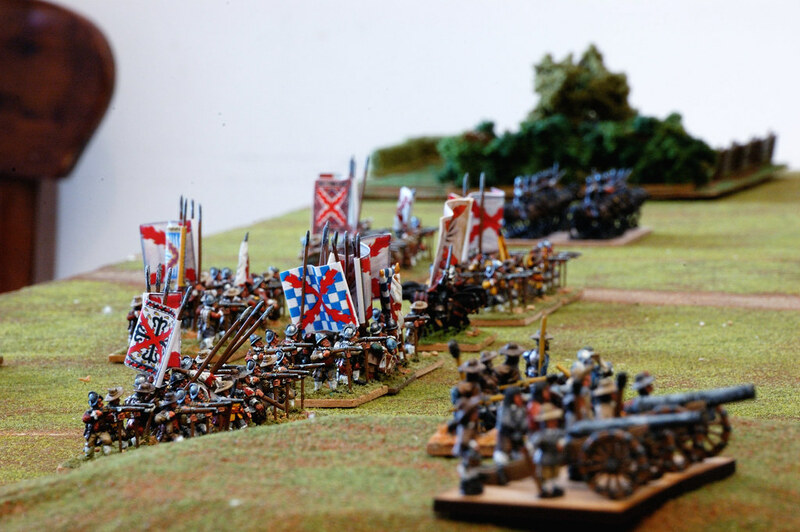 It negociated an alliance with Sweden (typical from those traitors of the true faith to pact with heretics) so their famed troops joined the french army, as the enemy to beat was very hard and had a reputation as high as the swedes. It was the Army of Flanders. 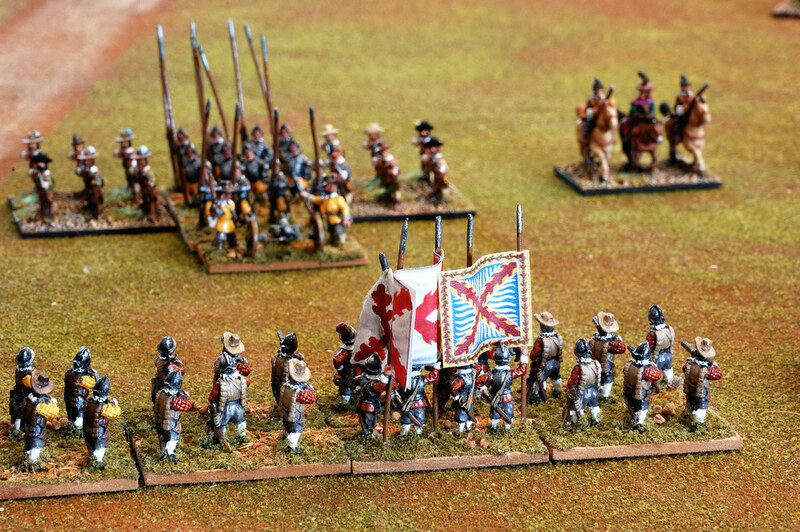 On their way to Brussels the french army found the spanish deployed and offering battle, which was accepted by the french high command and their swedish allies. The battlefield had some encolsed fields on the corners and two hills, one of them offering a great place for the spanish artillery. On the french side some walls could gave protection to their troops. 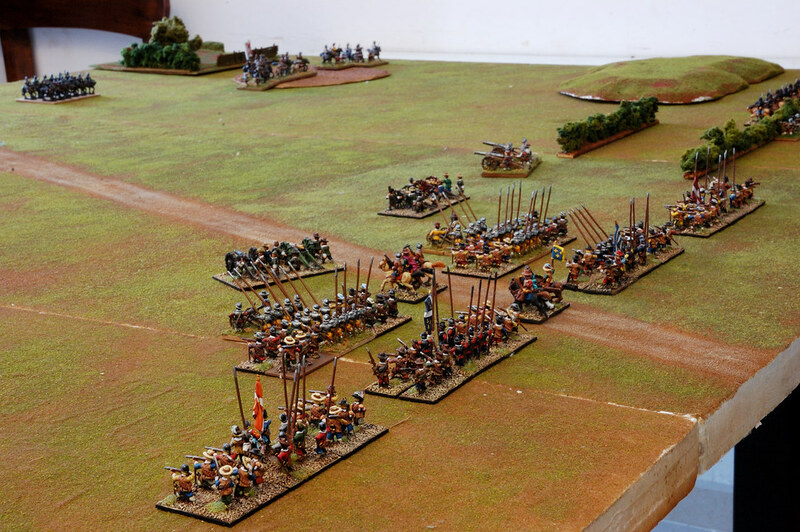 The french deployed their allies on the first line, trusting the power of the swedish brigades. 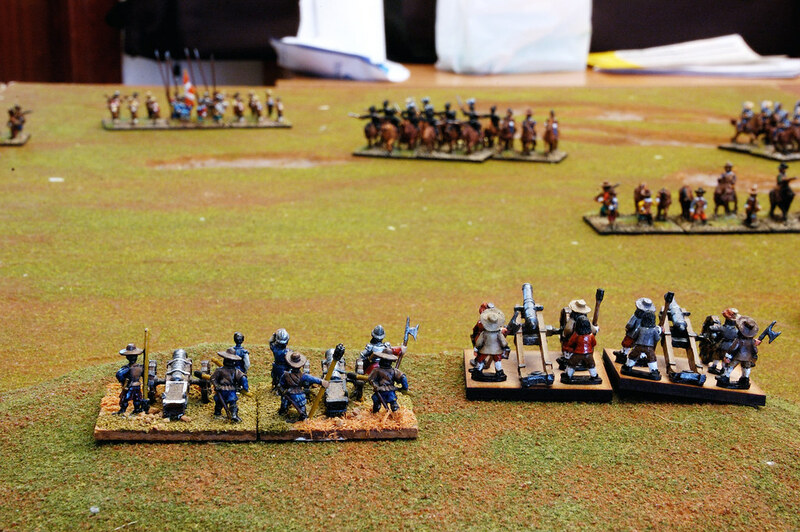 Behind them was the french infantry, with swedish reiters and command shot on their right flank and cuirassiers, the Royal Musketeers and dragoons on their left. 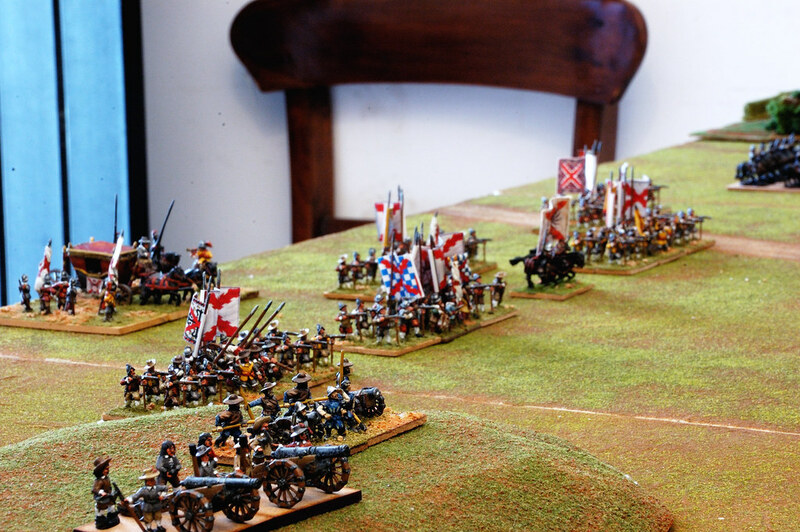 And as a special, three artillery batteries aiming at the center of the spanish deployment, ready to annihilate anyone who would dare to cross their fields of fire with an storm of cannonballs. 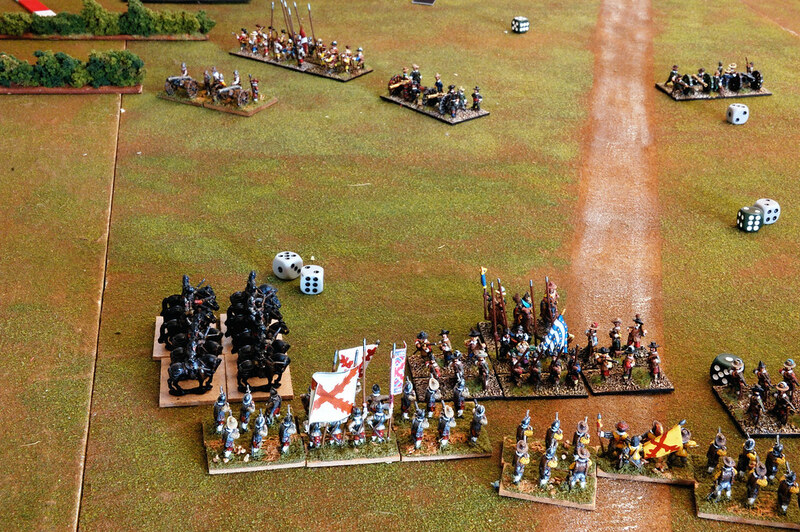 The spanish army deployed its veteran infantry on the center, dragoons and one group of cuirassiers on their left and the rest of cuirassiers on the right. 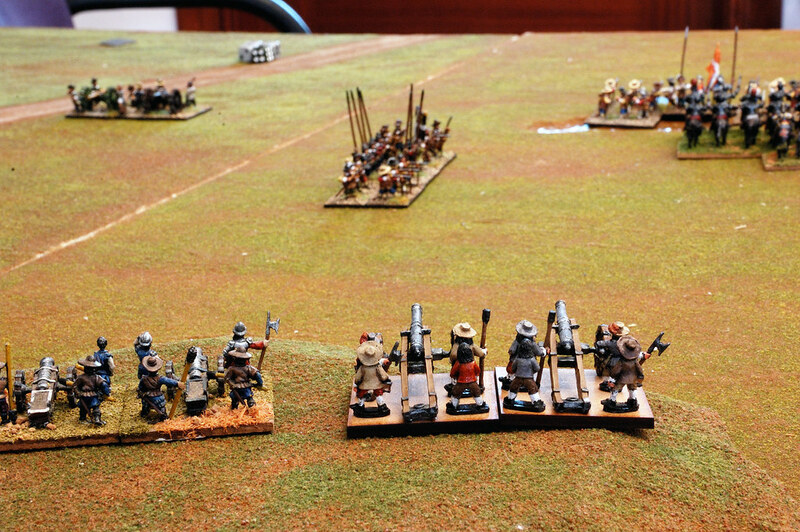 The artillery was on the hill between the infantry and the cuirassiers. 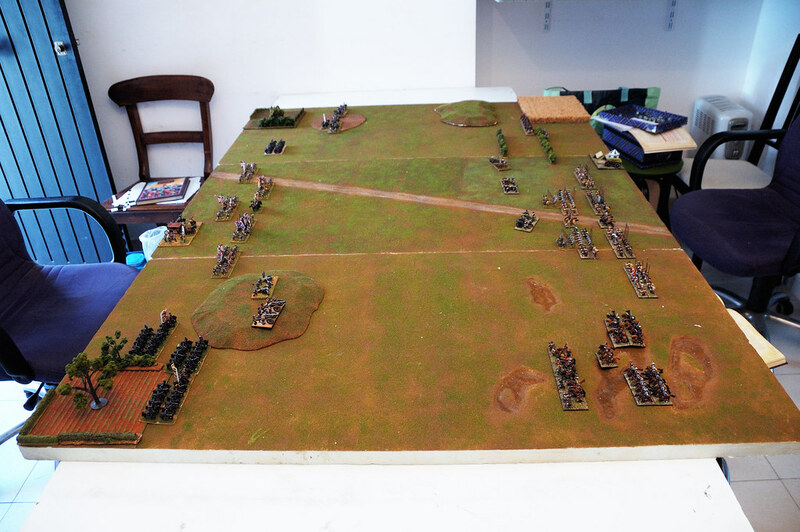 A heavy silence got grip of the battlefield as both armies looked at each other. 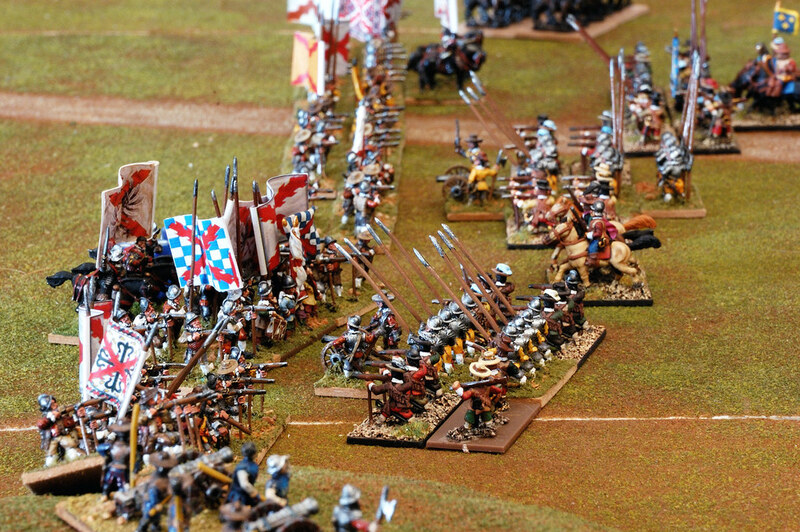 The french end the waiting and advance all their army. The ground trembled with the steps of thousands of boots and horseshoes and the sky roared with the fire of the great number of artillery guns. But in front of them were the Flanders´ veterans, old soldiers with great experience. 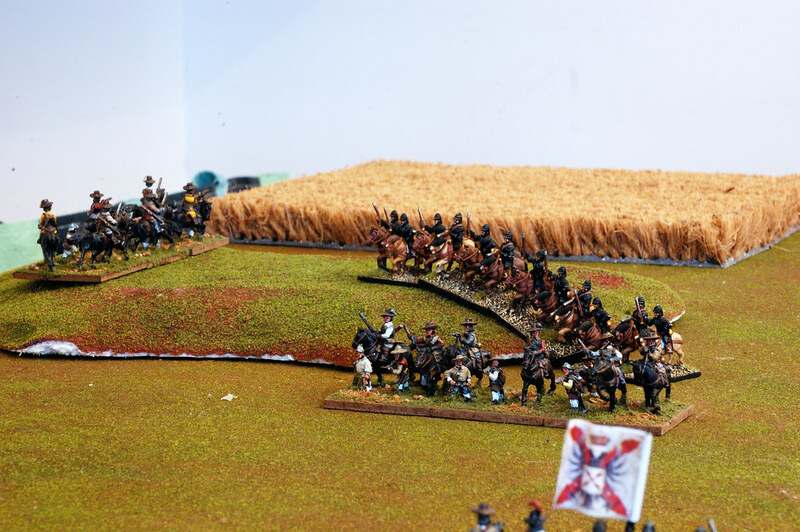 Their instinct led them to deploy a little bit back from the rest of the spanish army and they were right to do so, as the shots from the french artillery fell short and couldn´t reach them. 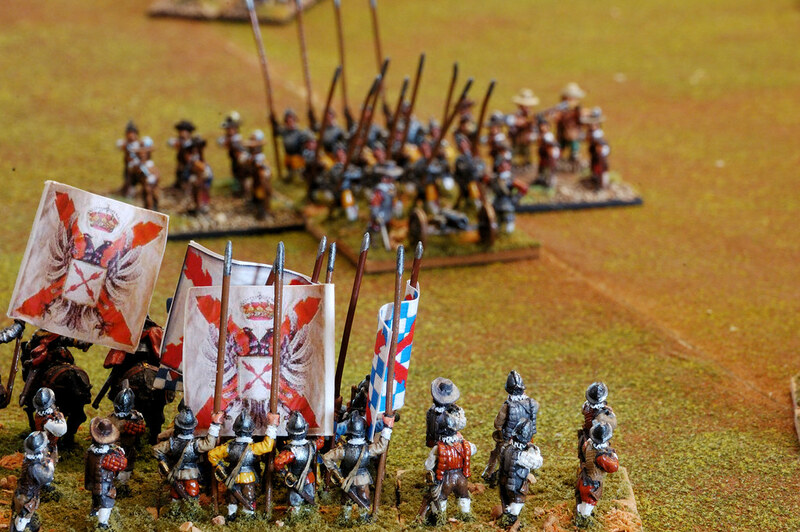 One of the main advantages of the french army was negated right from the start. 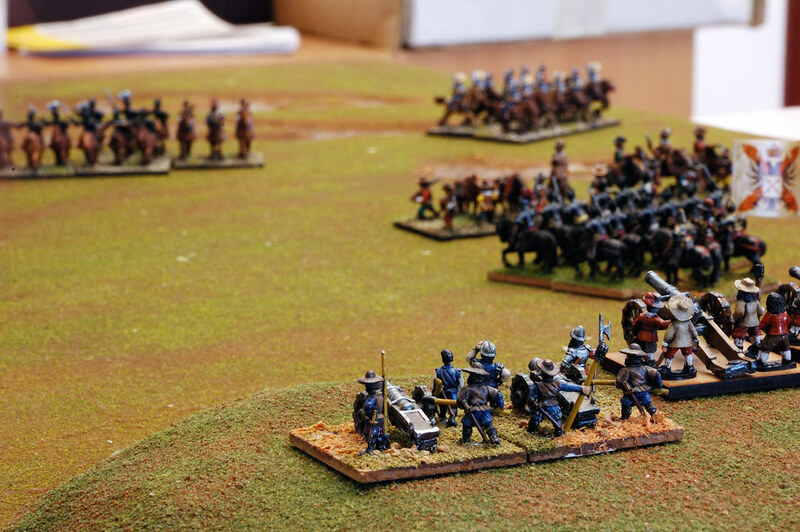 The spanish high command ordered the cavalry and dragoons to advance, but not the infantry. 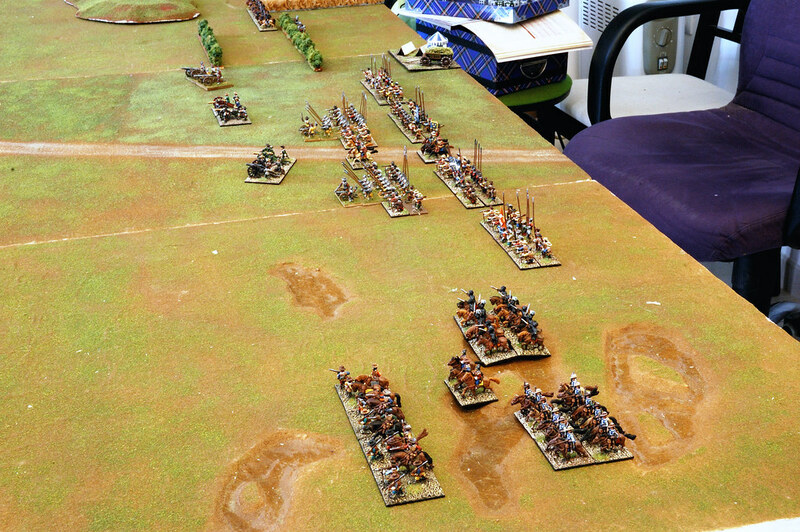 The french tried to provoke the tercios with taunts and accusations of cowardice to make them advance and enter the mortal artillery trap, but the veterans complied with the orders and answered with silence, waiting patiently the moment when they could answer the french affronts with steel, lead and blood. 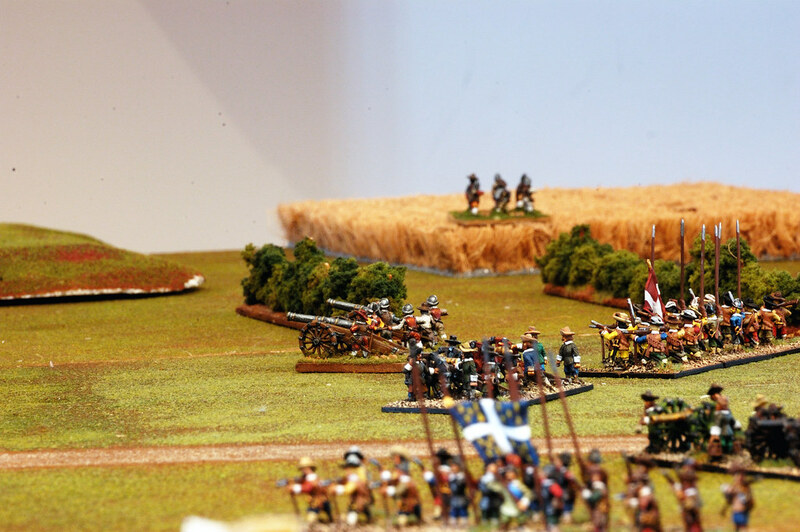 The spanish artillery, however, had targets in range and started firing with success. 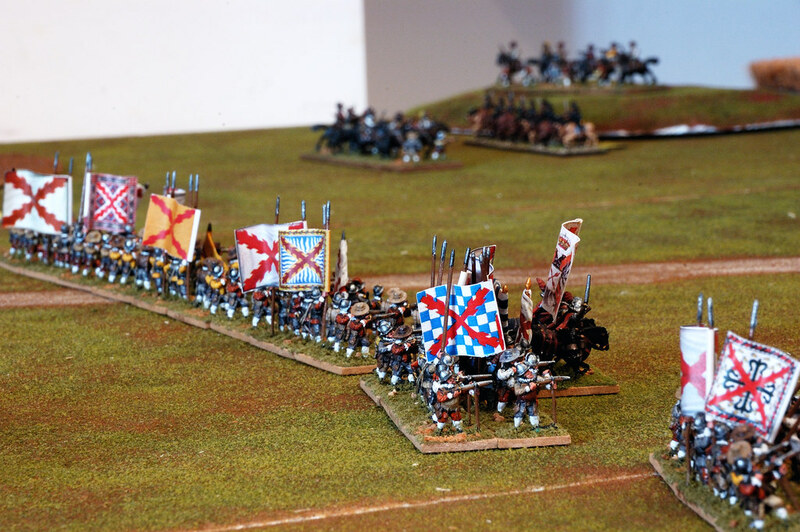 The spanish cuirassiers on the right press on their enemies. 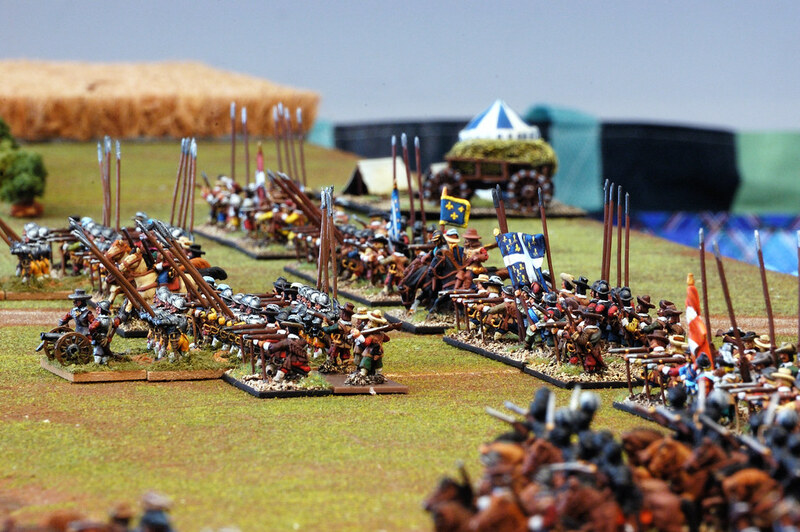 The spanish dragoons surround the swedish reiters, which advance unsupported and alone. 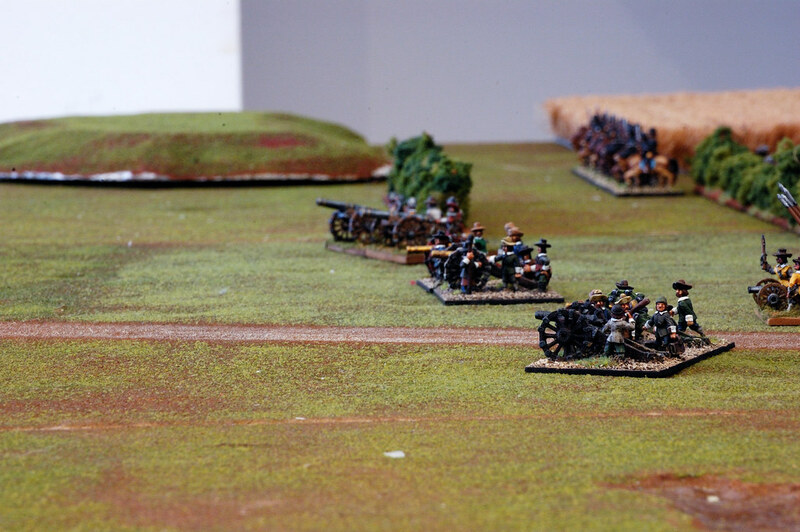 The french artillerymen, furious and impotent, turn their guns against the spanish left flank. 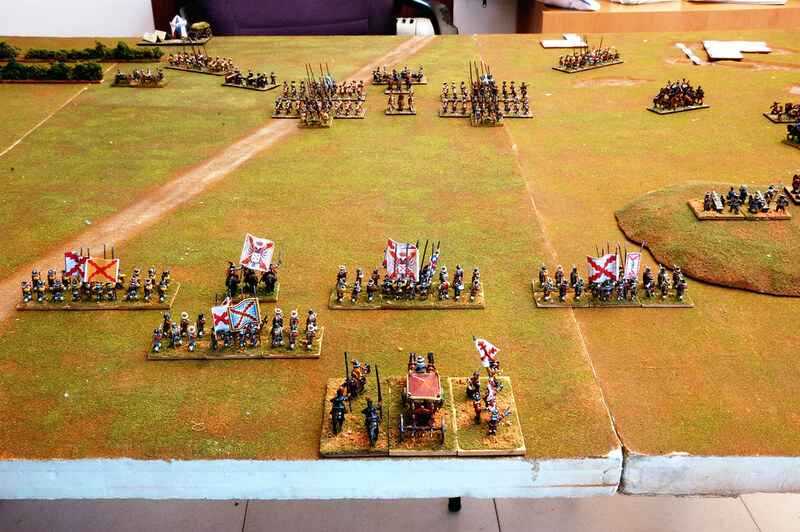 The french keep advancing while the spanish infantry keep waiting, impassive. 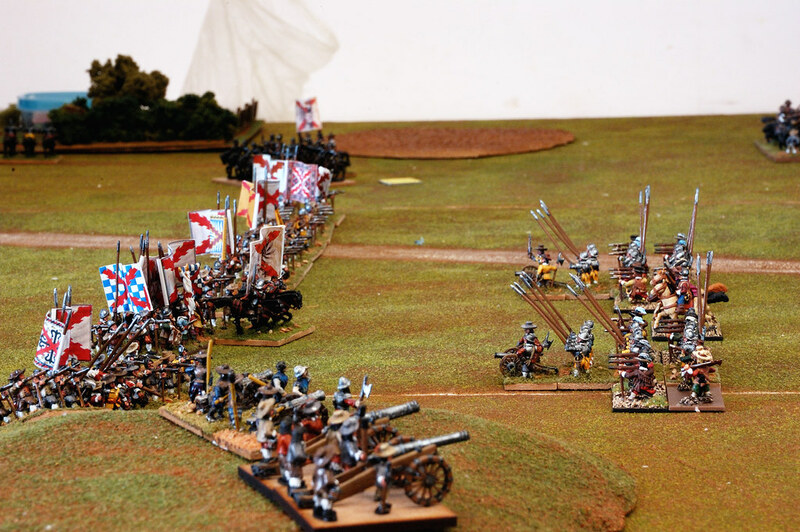 The spanish artillery punish hard the french cuirassiers, killing half their numbers, but they keep the spirits up and charge their enemies! 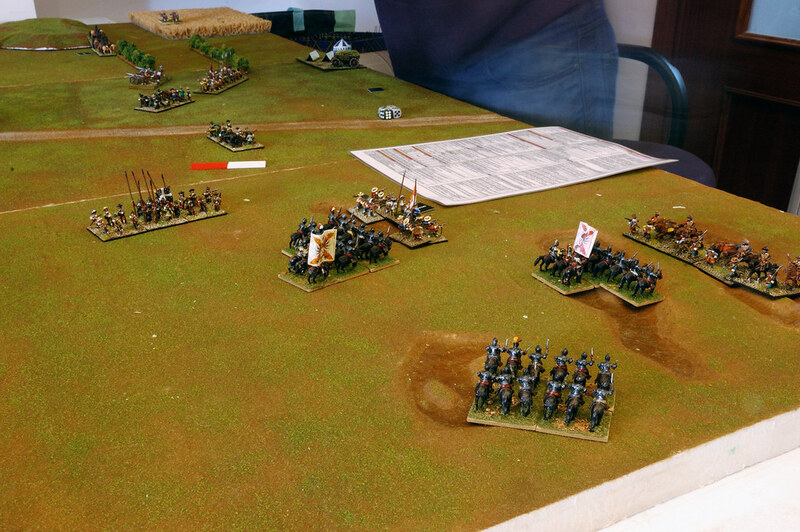 On the spanish left flank the dragoons punish the cuirassiers. 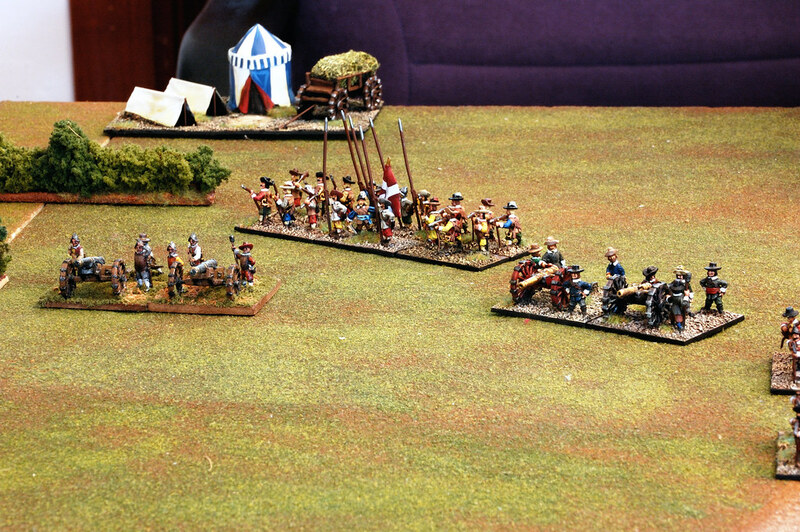 The spanish cavalry try desperately to exit the arch of fire of the french guns. 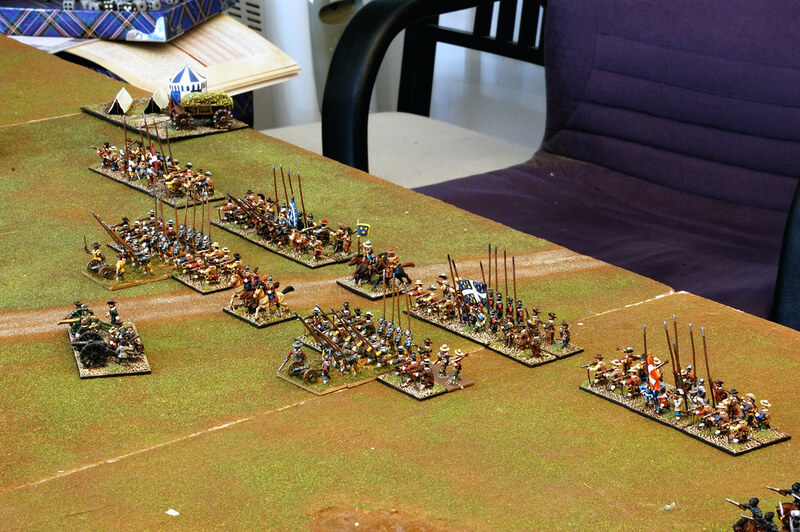 The swedich reiters charge and almost catch the spanish dragoons in front of them. 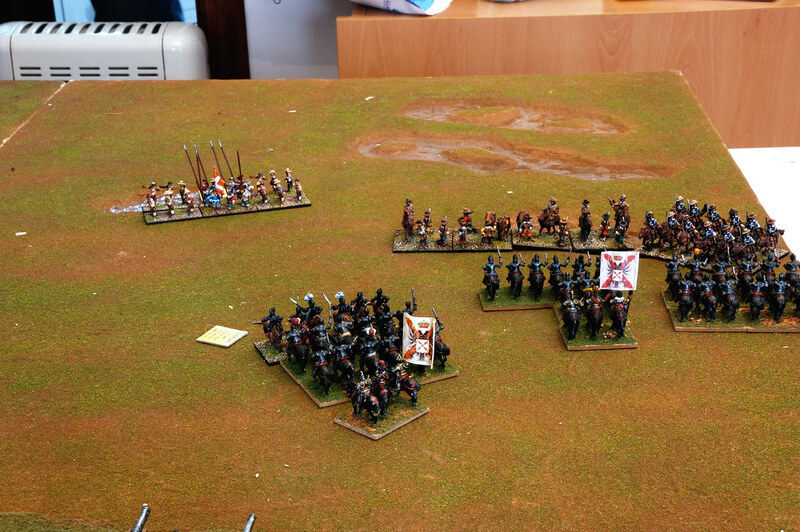 The spanish cuirassiers are fired upopn and lose cohesion. 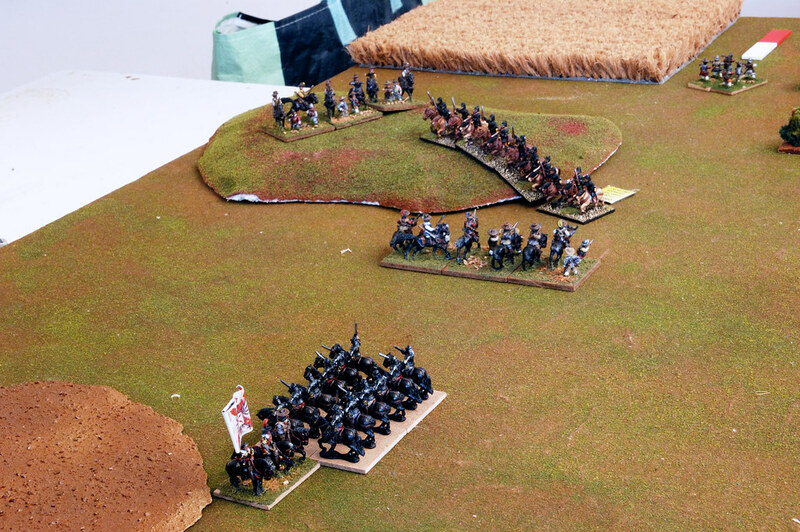 Tragedy looms in the spanish left flank. 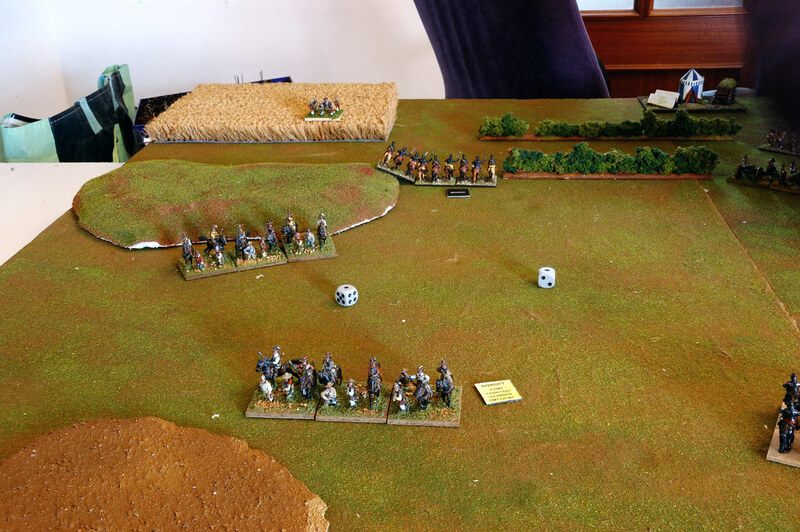 The french general with the cuirassiers dies in the charge! 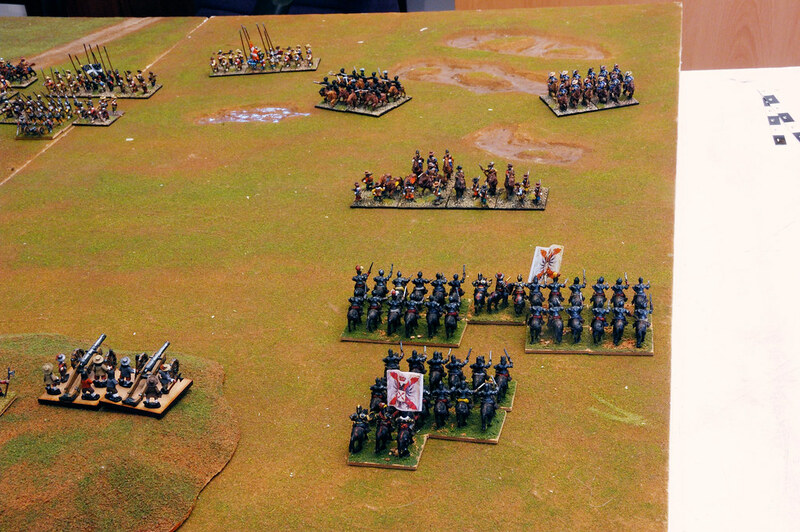 The spanish cuirassiers keep pressing and the french bring on infantry reinforcements guessing that their cuirassiers would fall. 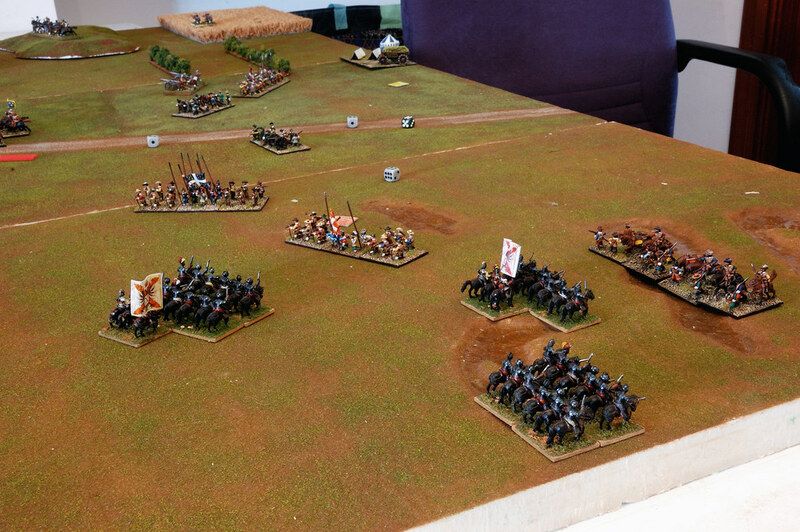 They do and the victorious spanish cavalry faces two infantry regiments. 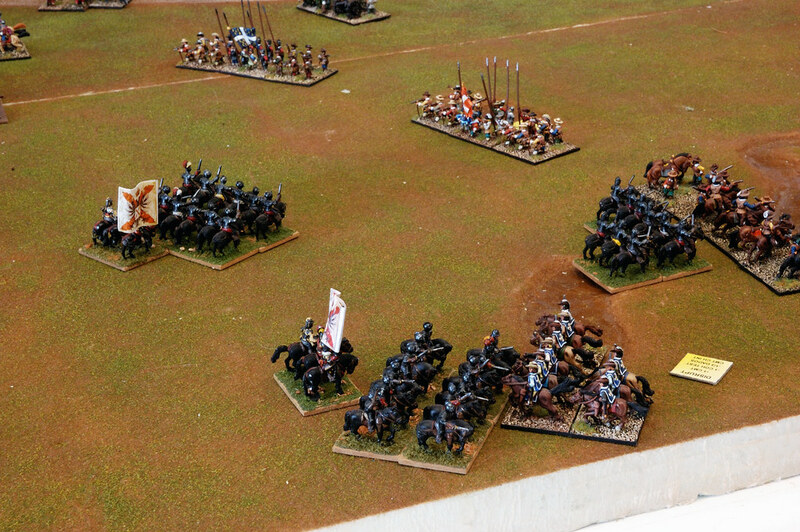 Another group of cuirassiers almost catches the french dragoons and the third is beating the same Royal Musketeers. 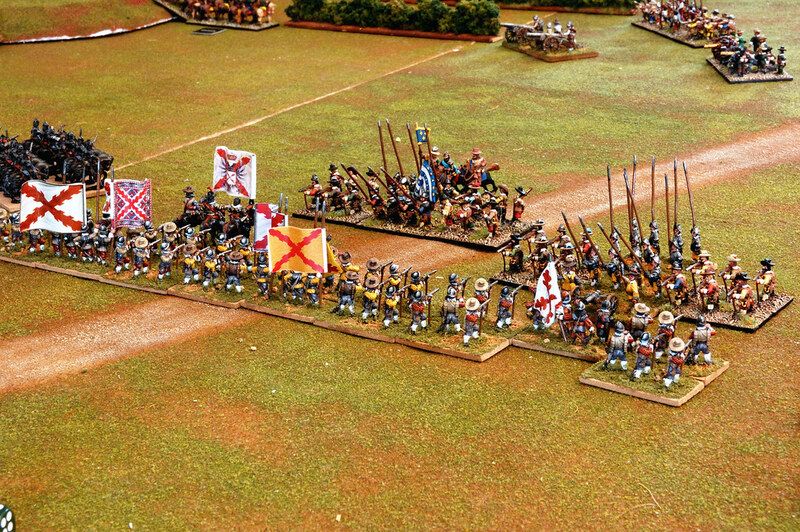 As the french guns have turned and are firing against other targets, the infantry tercios finally advance and form a line in front of their enemies. 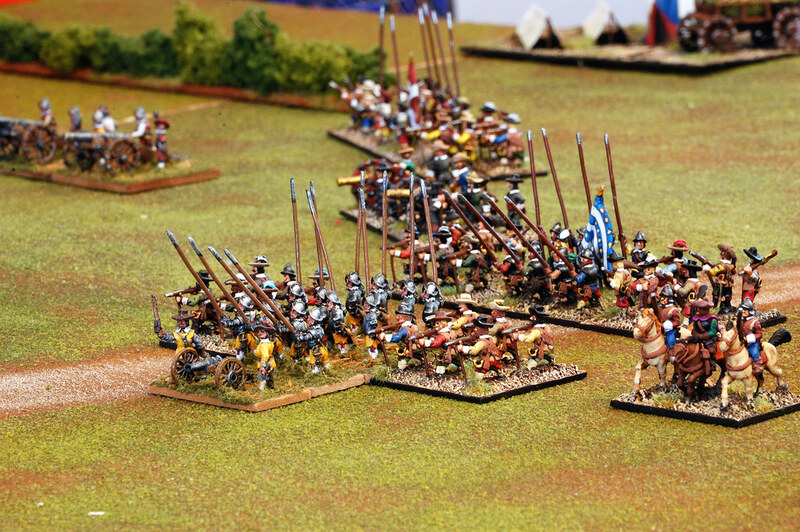 The spanish infantry turns to find another target. 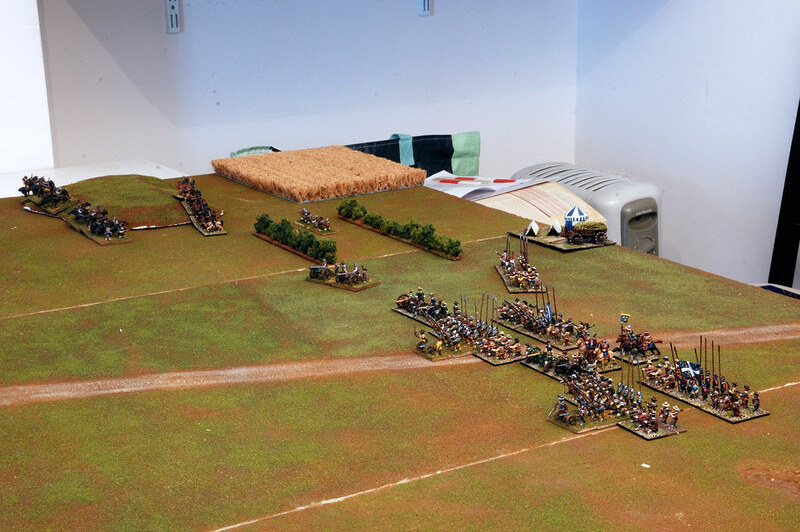 The swedish brigades head the french assault. 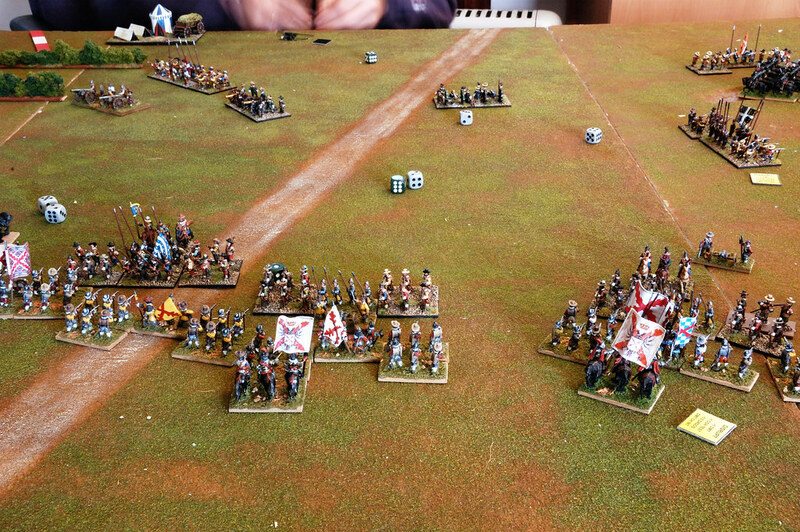 On the right flank the situation looks good for the spanish. 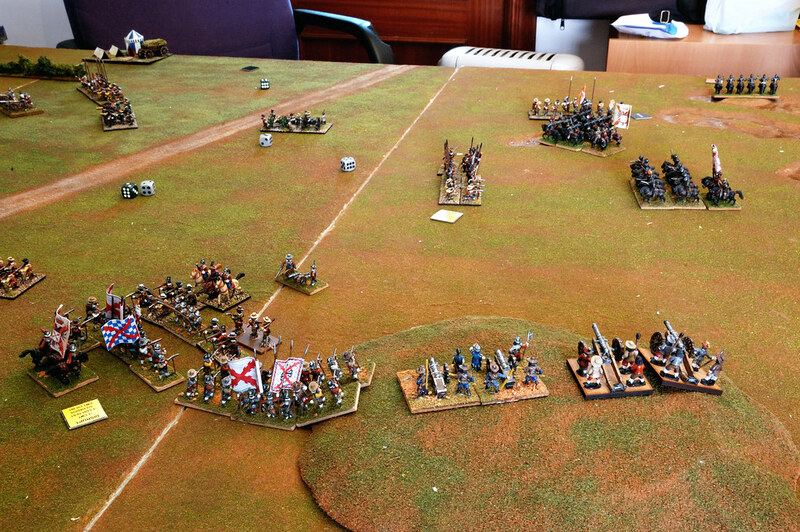 The artillery disrupts one infantry brigade so much that it flees as they see the spanish cuirassiers charging them. The Musketeers have been annihilated. 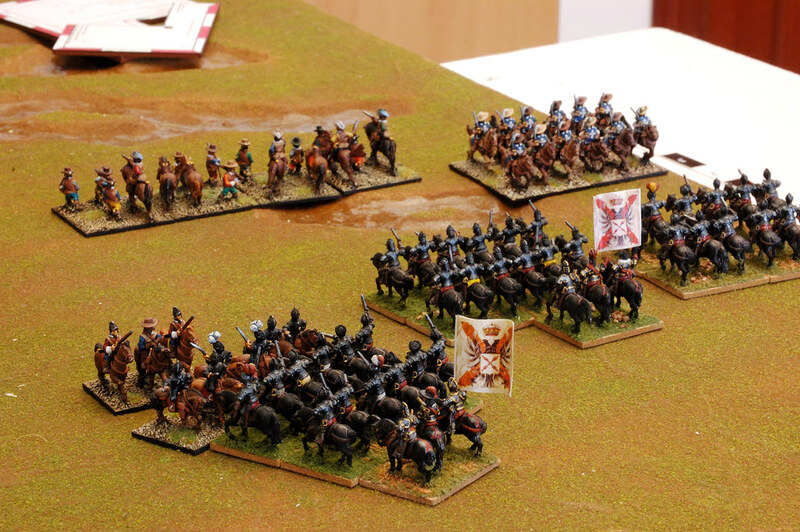 The dragoons, however, keep harassing the cuirassiers pursuing them and producing casualties. 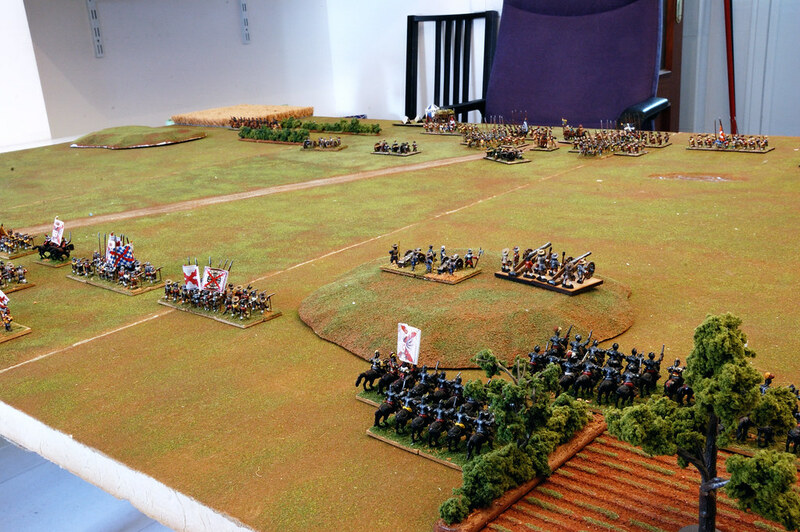 On the left flank the dragoons finally break the swedish cavalry. 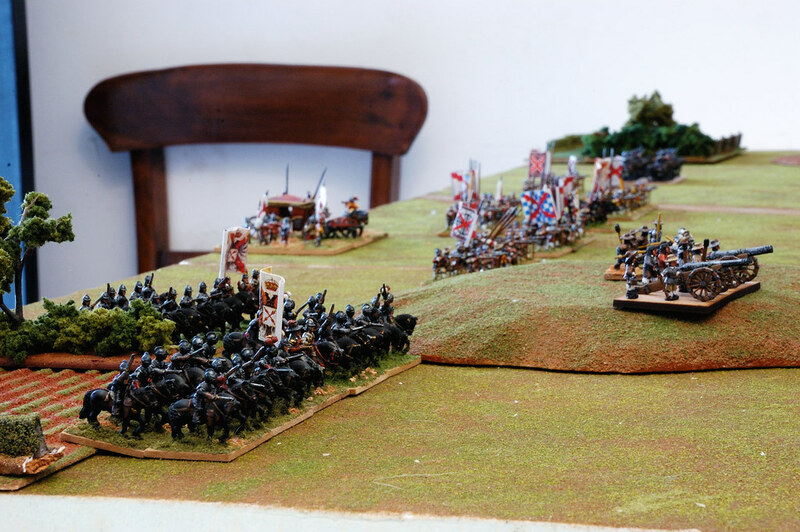 The french flanks are crumbling! 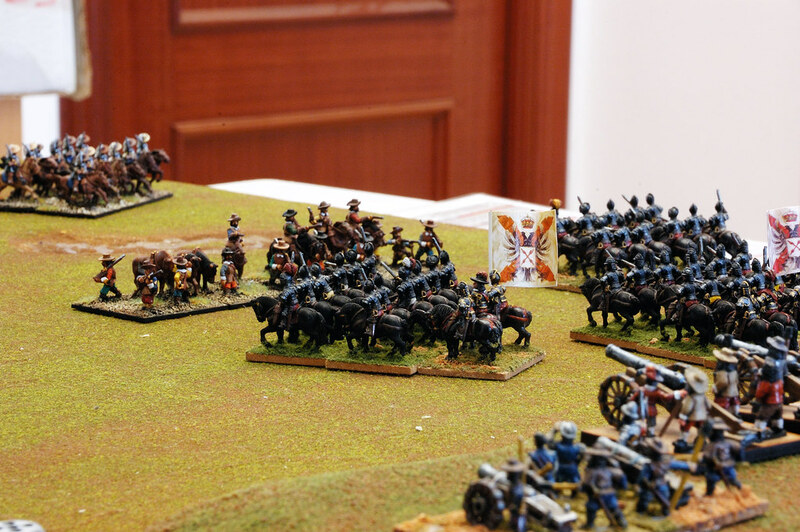 The spanish guns find another target. 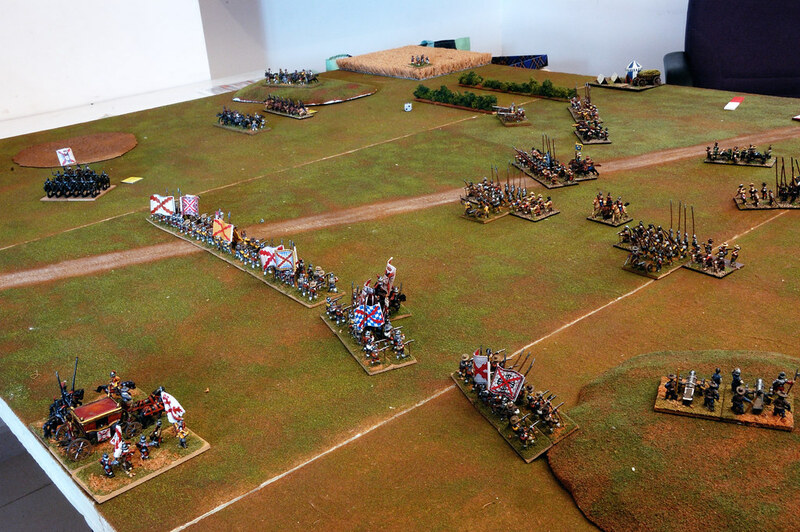 The infantry reach musket range and the battlefield is covered with smoke! 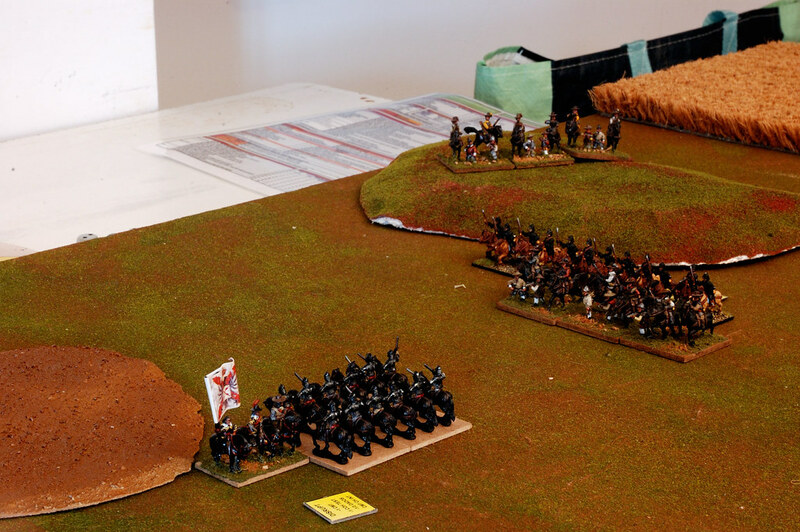 Misfortune falls on the french as the spanish cuirassiers pursuing the french dragoons catch and finish them. 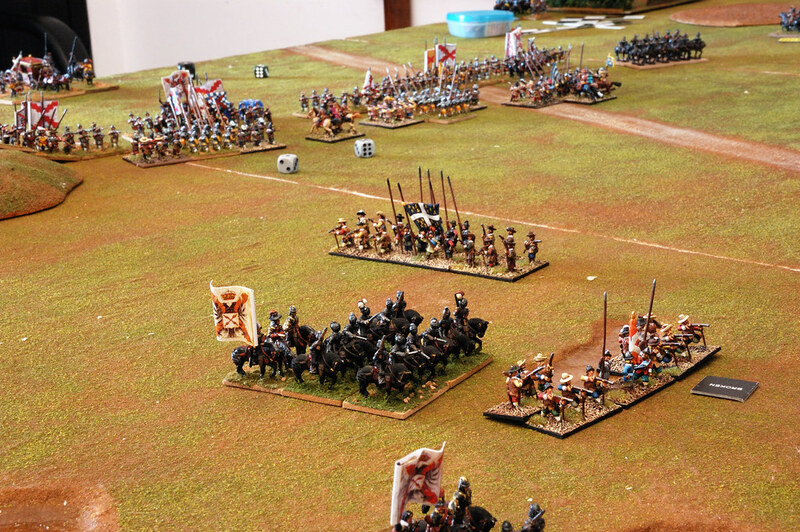 The spanish artillery keep doing a great job and disrupts another infantry regiment. 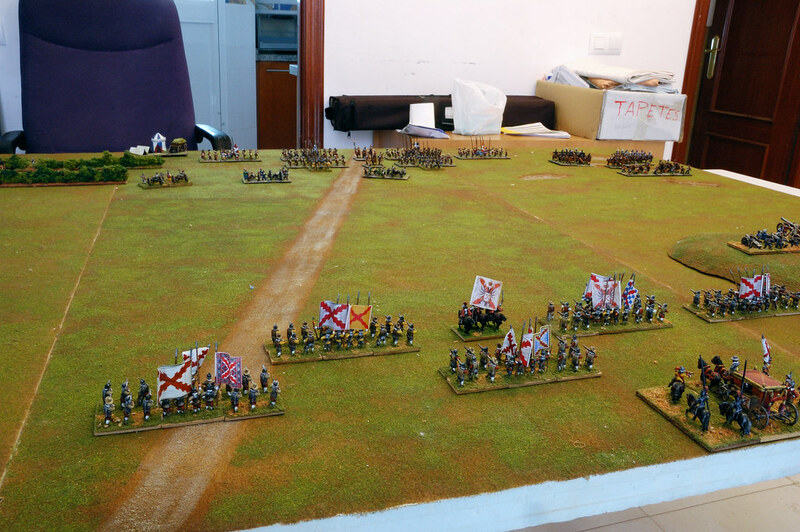 The infantry exchange fire and casualties are produced on both armies. 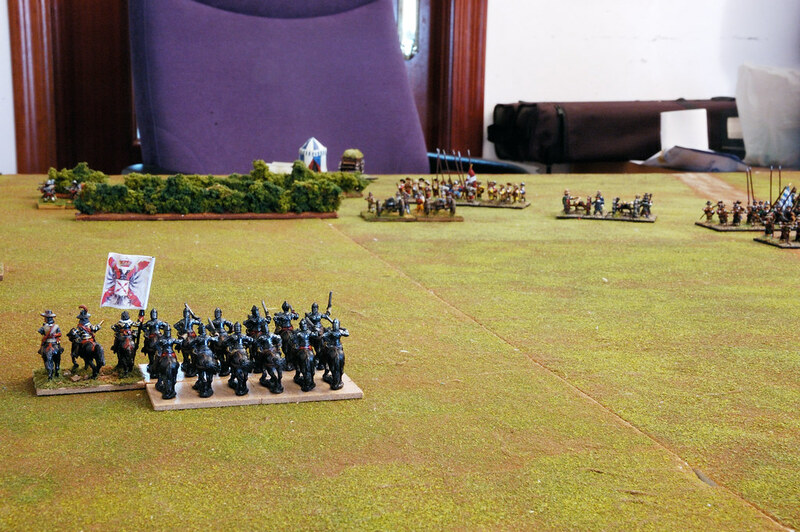 The french situation is desperate: many groups are routing, their flanks have evaporated and the infantry is reaching fire range separated and unsupported. 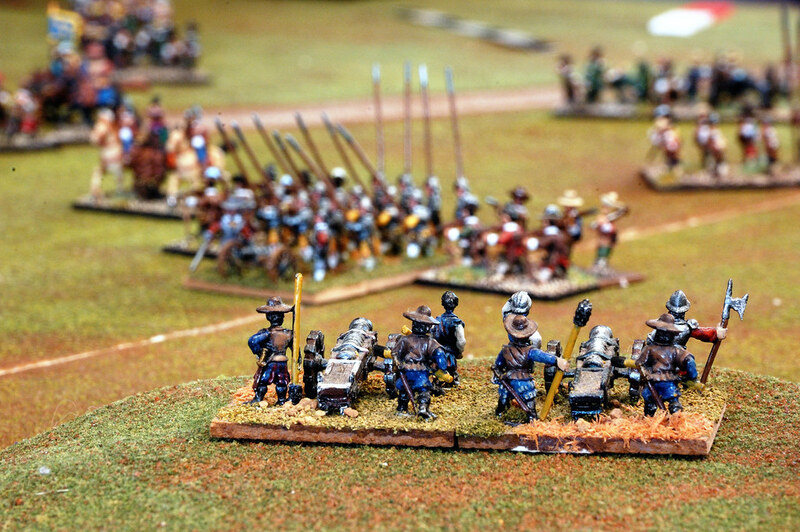 The spanish can concentrate their fire. 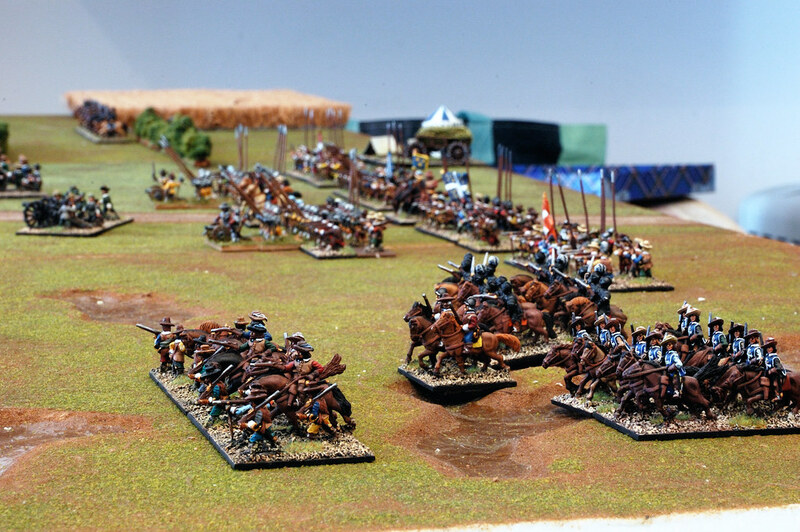 The spanish cuirassiers of the left flank have been able to evade the french guns and surround one french brigade. At that moment night fell and both armies stopped the fight. Victory for the Army of Flanders! And finally, some more eye candy.